Welcome to Deltek for Professional Services (DPS), the next generation solution for professional services automation (PSA). If PSA is a new term for you, think of it as a specialized system like an enterprise resource planning (ERP) solution except specifically designed for the professional services industry. Also, check out this short article to learn more about PSA. So, what can DPS do for your firm? Let’s see how this new cutting-edge solution will add value. 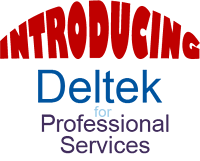 What is Deltek for Professional Services? At its core, Deltek for Professional Services is a solution to assist your professional services firm with overcoming industry challenges and give you the tools needed to gain a competitive advantage. Whether it’s winning more work, recruiting new talent, providing top-notch project delivery or accurate forecasting of final performance, DPS will help your firm stay focused on the future. As a complete and all-inclusive package, DPS will positively affect all the core areas of your business by streamlining your processes. Knowing if you have enough pipeline to meet your firm’s future goals is critical to measuring the success of your business development efforts. With Deltek for Professional Services, you can eliminate business development shortcomings by providing your team with a collaborative platform to enable every team member to stay engaged and up to date. Even more, DPS is an integrated solution that allows your business development team to create proposals based on the historic performance of your firm. As a result, your firm can create actual target revenues per account and realistic revenue forecasting. Using Deltek for Professional Services, building a project plan has never been easier. With an improved user interface based on iAccess for Deltek Vision, DPS allows project managers to develop plans based on the performance of similar projects. Managers can simply build key performance indicators (KPIs) and milestones into these plans which can track the success of a project. Furthermore, these KPIs and milestones can be used to develop a project management dashboard that lets project managers see all critical project information on a single screen. Tracking project profitability can be challenging. However, Deltek for Professional Services makes this process simple by eliminating the guessing game with dashboards and alerts to let you know how a project is faring. DPS allows you to monitor the key metrics that can determine the success of a project like margins, utilization, and cash flow. With this tracking system, you can keep your finances on target. Ready to make the move? Deltek has a plan to transition your firm to DPS if your firm is currently on Deltek Vision. Contact us to find out more about preparing for the migration. If you’re not currently using a Deltek product, Full Sail Partners can help your firm determine if DPS is right for you!